In the photo at right, notice that the driveway slopes sharply from the sidewalk level to the street level, and the slope is directly in the path of a pedestrian walking along the sidewalk; the pedestrian can't avoid walking in the slope. This is a serious problem for someone in a wheelchair, or a blind person. It could also be a problem for someone pushing a baby stroller or shopping cart, an older person with poor eyesight, or anyone in an area where the lighting is poor after dark. This is an example of a situation where the needs of motor vehicles have been given higher priority than the needs of pedestrians. 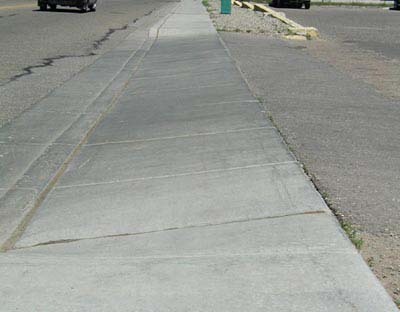 In the second photo, there is a buffer between the sidewalk and the street. This allows the driveway slope to be placed within the buffer, rather than in the pedestrian path. The sidewalk remains level. 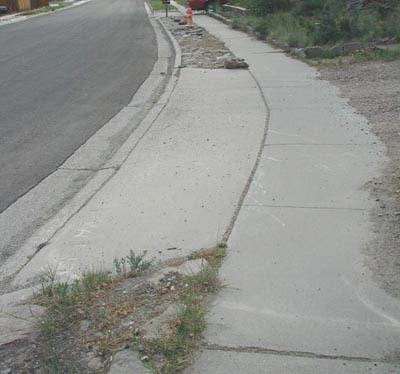 If there is no buffer, dealing with the driveway slope is more difficult. One solution is to lead the sidewalk behind the driveway slope, as shown in the diagram below (from the Oregon Department of Transportation's Oregon Bicycle and Pedestrian Plan). This keeps the path level, but makes it less direct. It also requires an additional right-of-way behind the sidewalk path.